Today a continuation of my work dealing with American Slavery in the ante-bellum period. These next articles deal with the subject of what happens when laws are made that further restrict the liberty of already despised, or enslaved people. 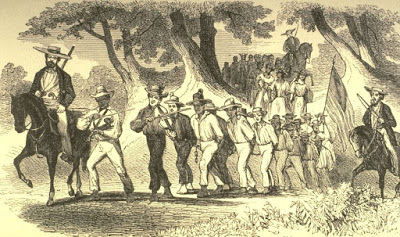 In this case the subject is the Compromise of 1850 and its associated laws such as the Fugitive Slave Act of 1850. This is an uncomfortable period of history for Americans with either a sense of conscience, or those who believe the racist myths surrounding the “Noble South” and “The Lost Cause.” I hope that you find them interesting, especially in light of current events in the United States. The ante-bellum South was an agrarian society that depended on the free labor provided by slaves. In a socio-political sense the South was an oligarchy that offered no freedom to slaves, openly discriminated against free blacks and provided little hope of social or economic advancement for poor and middle class whites. However, despite this, even poor whites supported it. Many Southern Yeoman farmers were willing to tolerate their second class status because they: “feared the fall from independent producer to dependent proletarian, a status he equated with enslavement”  more than remaining subservient to planters and plantation owners. 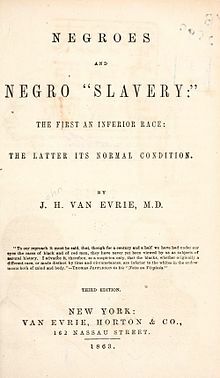 In fact, for them slavery was the one institution that kept them above the despised black. Even so, the fact that the slave barons “were forced at every election to solicit the votes of “ignorant, slovenly, white trash in the country” with “frequent treats that disgrace our elections,”  rankled and humiliated many members of the Southern aristocracy. It was a marriage of two disparate parties linked by their membership in a superior race, something that only the continued existence of slavery ensured. Georgia Governor Joseph E. Brown emphasized the threat to whites in that blacks would be their social equals and competitors. The racial component assured poor southern whites that they were superior to blacks and an Alabama lawyer wrote “The privilege of belonging to the superior race and being free was a bond that tied all Southern whites together… and it seemed from a Southern stand-point, to have for its purpose the leveling of all distinctions between the white man and the slave hard by.”  But poor white workers who remained in the South “repeatedly complained about having to compete with slaves as well as poorly paid free blacks”  leading many to seek a new livelihood in either Free States or the new territories.